An athlete rarely has the opportunity to leave on their own terms. While most would love to retire hoisting a championship trophy or a gold medal, many fall victim to injuries or fail to reach the standards of excellence set by their younger selves. Or they live to see athletes of a younger generation come and take their place. Athletes come and go everyday in the world of sports. But this past week served as the final farewell for two of the greatest champions and legends in track and field history: Usain Bolt of Jamaica and Sir Mo Farah of Great Britain. For Bolt, the World Championships was supposed to be a coronation and celebration: he wins gold in the 100m and 4 x 100m relay, he is lauded for his various accomplishments, and then we all cry as he moves on to life outside of track. Instead, Bolt finished 3rd in the 100m behind longtime rival Justin Gatlin and then suffered a devastating injury during the finals of the 4 x 100m relay. Still, when Bolt crossed the finish line, the whole track and field community stood and applauded in appreciation of what he had accomplished. (Yes, my wife stood up and clapped and cried as he walked around thanking the fans.) And while he earned fans for his blazing speed, he lit up the world with his smile, his personality, and his dancing. Sir Mo Farah emigrated to Great Britain as a boy and rose to prominence on the world stage winning multiple championships in the 5,000m and 10,000m. Having already won the 10,000m at this year’s championships, Farah was looking to win yet another 5,000m/10,000m double at a major championship. His hopes of completing the double were dashed as he finished 2nd in the 5,000m. In the typical understated manner of British culture, he promptly announced his retirement in the interview following his race. 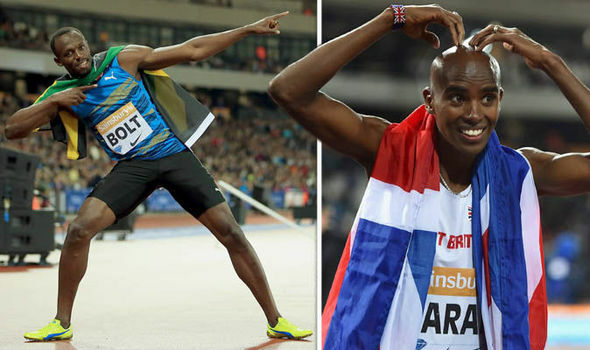 While he thanked the London fans during his lap of honor, his competitors and fans did his signature “Mobot” celebration to show their appreciation for all that he had accomplished in his career. It would have been quite fitting to see two of the most decorated athletes in track and field history claim additional gold medals in a stadium filled with supporters. For them to end their careers as champions would have been deserving and incredible. But as they leave the sport, let us celebrate them for all that they accomplished and all that they sacrificed to show us the fruits of their athletic labors. Also, let us be thankful as they step aside and make room for the next generation of athletes to achieve superhuman feats that were once thought to be impossible.